Custom orders with styles for teens to plus size ladies! 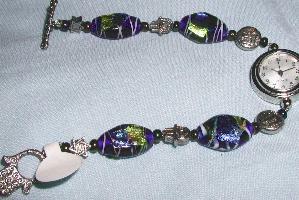 Length @ 8- 8 1/2"
with 1 bead on each side can be orded. Thus removing @ 2" in length. All watches marked may be custom ordered. Faces of watches may vary. 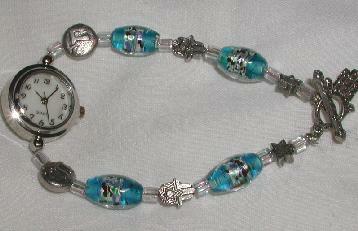 Custom ordered beads and charms are also available. 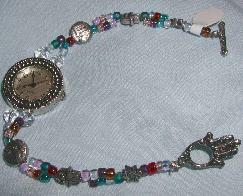 Watches pictured are for adult sizes. Petite and Teen sizes can be ordered at a reduced price. Shalom, Noah's ark, Jerusalem and Tree of Life Theme Watches. 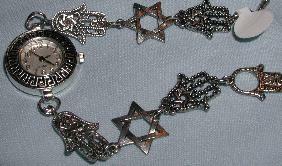 Plus new toggle clasps with star of david or grape vines.